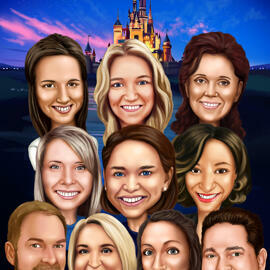 Order a cute cartoon drawing from photo, drawn in colored digital style. One of our professional artist can draw an original full body drawing of a man, woman or a teenage girl or boy, who is celebrating his/her retirement or farewell day. For your information we prefer a high quality photographs and mentioned by you the necessary ideas and wishes in the requirements box below. If you would like to receive a cartoon drawing of the same design, then save it and attach with personal photographs, and our artist will try to make it happen.Cartoon Drawing executed in digital style will be delivered as a ready to be printed JPG File to your Email by default. It is also available to deliver your cartoon drawing as Printed Photo, Printed Canvas or Original Drawing on A4, A3 Paper. Worldwide shipping.